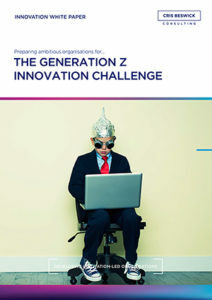 Our latest thinking on how Generation Z will change the way organisations approach innovation. This white paper is about understanding the Innovation Roadmap, in particular the new roadmap, which will be driven by Generation Z. Along the way we’ll touch on some of the key aspects of innovation, such as why an innovation culture is important, finding the right drivers/enablers and what it’s going to take to build ‘Next Generation Organisations’.